So many new cars as never before sold a local dealer at this year's “Automobil Freiburg” from 8 to 10 March. Eberhard Groß of HGS Concept, who accompanied the company as trainer and coach at the trade fair, made a significant contribution to this top result. "Selling new cars - at a fair? You have to be crazy!" Eberhard Groß heard such slogans more than once when he accompanied for the first time a local dealer at “Automobil Freiburg” for HGS Concept as a business coach and trainer. But success proved him right. For 6 vehicles a deal was closed by the team with his support back then. That was in 2000. Once set in motion, things picked up speed in the following years, with steadily increasing success. In 2017, the dealership made 186 sales, last year, the 200 mark was cracked. For the 20th anniversary of the trade fair Groß and the team were able to top this super result again. With 227 vehicles, the dealership sold more than ever before. Crucial for the success is an efficient division of tasks at the sales booth. As a first point of contact, the fair visitors will have access to a well-trained team of promoters. Following this, individual expert advice is provided by the colleagues from the dealership. Many guests took the opportunity to test drive. At least 228 times, potential buyers took the wheel to experience the different models on the road. The exhibition was rounded off by numerous attractions on the stand, including a virtual reality station. The sales of diesel cars had reached a high level of 42 percent again. Because of that, Eberhard Gross is optimistic, diesel seems to be still attractive for buyers. 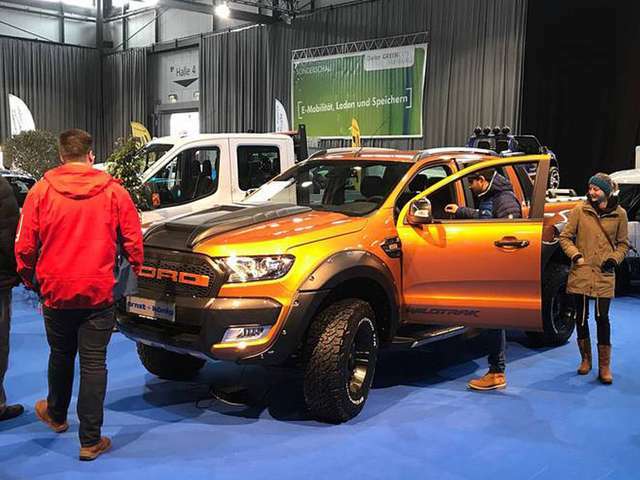 After the discontinuation of the “AMI” fair in Leipzig, “Automobil Freiburg” is the second largest auto show in Germany - and is increasingly becoming a sales fair. This year it set a new record with 25,000 visitors.